Matt DeLeon is a 1st semester ARE major and a student in OEP Director Rich Miller’s Honors UNIV course in Environmental Sustainability. He attended Anthony Leiserowitz’s Teale Lecture on Nov. 20th, and wrote this reflection, as a voluntary class assignment. Anthony Leiserowitz’s lecture entitled, Climate Change in the American Mind, was extremely worthwhile to attend and was quite possibly one of the most unique and important perspectives that I have heard on the global warming issue to date. Leiserowitz is the Director of the Yale Project on Climate Change Communication and a Research Scientist at the School of Forestry and Environmental Studies at Yale University. His talk to the UConn community was less about the “science” behind global warming, but more about how it is perceived by Americans, and why it has caused so much debate. Leiserowitz opened the lecture with his “Big 5 Beliefs about Climate Change.” These five beliefs amount to only ten words, but encapsulate what he believes are the five salient facts that all Americans should know about climate change. They are as follows: It’s real, it’s us, it’s bad, scientists agree, there’s hope. This idea simply conveys to the public that climate change is occurring due to human activities, that it is actually causing harm, which all scientists agree on, while there still is a chance to stop and possibly reverse the negative effects, if the global community acts now. I thought that this message was extremely powerful, because most people are apathetic to global warming because they think that it is too complex for them to understand, but by just remembering these five short facts, any American can learn the truth about global warming. I also found the many statistics that Leiserowitz presented to be very interesting and a great enhancement to the presentation. One of the first statistics that he shared was that, according to his research, 66% of Americans think that climate change is real, while 18% believed that it is not real. He also shared with UConn the fact that only 50% of Americans believe that global warming is caused by human effects and that a mere 11% responded that they are “very worried” about climate change. Many of these results can be explained by the fact that it is impossible to visually “see” climate change. Leiserowitz explained that most people associate climate change with melting polar ice, which is why that image frequents media outlets, but this leads to a major problem. Polar ice is distant to most Americans and the fact that it is melting seems to be much less important than finding a job, protecting ourselves against terrorism, or paying off college loans. He also stated that these photos tend to not show human beings, so climate change is perceived to not be a threat to humans. Leiserowitz believes that these false notions are why climate change action has not gained much momentum in the United States, as its consequences on human health are not fully recognized or understood by the public and it is seen merely as a partisan political issue. There has been a fairly significant decline in the belief and or significance of climate change over the past few years as well. Leiserowitz explained that the poor economy and unemployment played a key role in this trend, as well as declining media coverage. He proposed that most Americans learn about climate change via the media, since it is more of a scientific issue and most Americans don’t know a scientist, so media outlets are their only sources of information, since they do not read scientific journals either. If the media stops reporting on global warming, the public will not hear about it as much and not see it as a big deal. Within the past year, however, the American people have started to think about global warming more, as the economy has improved and the media coverage has increased. Another critical factor is that there have been many major weather events that hit Americans hard over the past two or three years. Hurricanes that caused a lot of damage in places that normally do not experience hurricanes, like New England, occurred twice, with Hurricane Irene and Hurricane Sandy. These storms were accompanied by the snowstorm, Nemo, in the winter of 2013. These weather occurrences can actually be felt by the public and sparked interest in this issue, as a hurricane in your backyard resonates better with Americans than melting polar ice, thousands of miles away. One of Leiserowitz’s other salient points in the lecture was that there are “Six Americas” when it comes to global warming. They consists of those who are alarmed (16%), concerned (27%), cautious (23%), disengaged (5%), doubtful (12%), and dismissive (15%). These numbers are somewhat optimistic because they reveal that the two highest categories consist of people who are concerned, or at least cautious about the effects of global warming. However, the problem with having “Six Americas” when it comes to this issue, according to Leiserowitz, is that there is not a unified conversation going on about the issue. For those who are alarmed or concerned, the conversation revolves around “what can we do to stop it?”, while the cautious and disengaged are more focused on “how does it affect me?” The final group consisting of the doubtful and dismissive are more interrogative and are simply asking, “is it real?” The lesson to be learned from the “Six Americas” of climate change is that if action is to be effectively and immediately taken, the country needs to be, for the most part unified, and have related dialogues. Overall, the lecture by Anthony Leiserowitz was extremely worthwhile and definitely changed the way that I look at global warming and how I will talk about and approach the issue in the future. The University of Connecticut currently owns and maintains approximately 500 vehicles including buses, emergency vehicles, and any vehicle that is owned by a UConn department. Of these 500 vehicles, there are currently 14 hybrids, and 11 fully electric vehicles. Although these vehicles only comprise a small percent of the current fleet, UConn is making great strides to incorporate more high efficiency vehicles. The University was awarded a grant through the Connecticut Clean Fuel program, which reimburses a portion of the cost of a clean-energy vehicle. 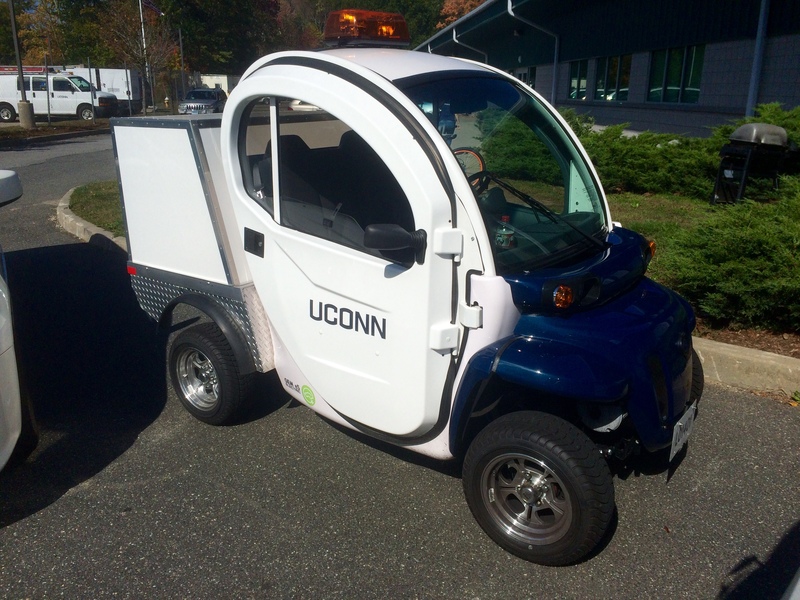 Some of the vehicles UConn has already purchased with the program are the new GEM (Global Electric Motorcar) Low-Speed Vehicles (LSVs). These are small vehicles that have a top speed of about 25 mph and are fully electric – perfect for local, on-campus trips. One of UConn’s fully electric GEM Carts. The University is also governed by federal and state mandates that require any purchase of a light-duty vehicle must be clean energy. All small vehicles and some trucks, regardless of whether or not they are eligible for Clean Fuel funding, must be what is called an E85 vehicle. E85 means the engine is compatible with E85 fuel, a type of ethanol blend. The Clean Fuel program, along with these federal and state laws, have helped the UConn fleet begin to increase the number of efficient, alternative-fuel, and hybrid vehicles on campus. Those numbers will continue to increase as UConn replaces its old fleet with new vehicles in the coming years.